A fungal disease is wiping out large populations of amphibians in the cloud forests of the Andean Amazon. Catenazzi spends much of his time searching for areas where the deadly fungus has not yet hit, hoping to find remaining populations of nearly 20 species of frogs that have been devastated by the disease. Many of the frogs are tiny, which means Catenazzi spends his days turning over rocks and digging through leaf litter. With a keen eye for detail, he occasionally spots what he believes to be a never-before-documented species. During an unplanned excursion in Peru, he was confident there would be undiscovered species waiting for him and his research companion Alex Ttito, a researcher with the Museo de Biodiversidad del Perú in Cusco. "We were driving by when I saw a man who had just cleared the access trail for a power line which cut deep into the montane forest," Catenazzi said. "I told Alex, 'we have to get up there.' I knew if we went, we'd find new species." They hiked along the cleared but still treacherous terrain, eventually finding a pristine cloud forest. Digging through leaf litter, Catenazzi discovered a tiny frog with reddish-brown coloring and blue-gray flecks. 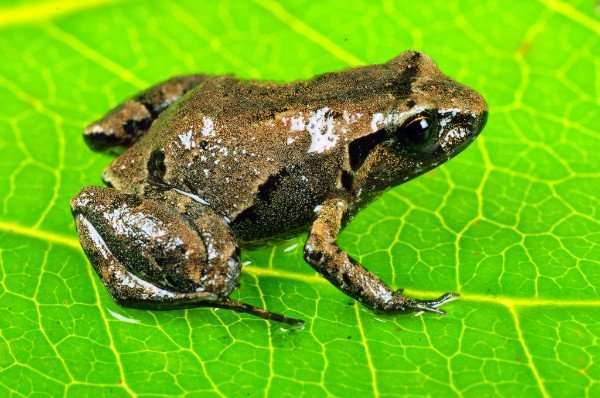 For the scientist who has discovered 28 new species already and spent much of his career in museums studying the world's frogs, he knew this tiny frog was a new discovery. He named it Psychrophrynella glauca, denoting its similarity to other species in the region and for its unique coloring. The discovery was confirmed by comparing the description of the frog to known species and through genetic testing. The finding was published this week in the journal PeerJ. Because of its size and remote location, little is still known about the newly discovered frog, but Catenazzi said the discovery of a new species is the all-important first step in conservation. "I believe in documenting biodiversity," he said. "We know the Andes are extremely rich in biodiversity, but people don't spend a lot of time looking for small things. It's tedious work. But there is a high value for conservation if we take the time to document." Today, Catenazzi's search for the vanishing frogs of the Amazon continues. He is hopeful he will find additional areas untouched by the march of the fungal disease. "People need to understand that if frogs are in such big trouble, we should be worried too," he said. "These pandemics affect us. Plants. People. These fungal diseases can be devastating." If he does find areas less affected by fungus in the Andean Amazon, he believes he will find populations of missing frogs and maybe even more newly discovered species.